Mumbai, a magical place with energetic vibes that cannot be felt anywhere else. It is truly a must visit place in India. It is absolutely recommended to plan a trip to this action-packed city. There is so much to explore here that you will be tired of roaming but Mumbai Darshan will not be complete. The heart of Mumbai, Taj Mahal Hotel. A night walk at Marine Drive. Waves touch the feet on Juhu Beach. The largest film industry, Bollywood and tour to its Film City. Gateway of India, an iconic monument. Stunningly built, Chhatrapati Shivaji Terminus. The heart of artists and art lovers, Jehangir Art Gallery. Religious people's admire Siddhivinayak Temple and Haji Ali. Apart from these, there is still much other stuff to explore in and around Mumbai. There is one more thing in Mumbai which is such that it cannot be ignorant, and it is the Street Food. So here is the list of Mumbai's mouthwatering street food which you cannot miss. Vada Pav is the most famous snack in Mumbai and you will find it on every street corner. Mashed potatoes with spices, coriander and garlic are fried until their colour becomes golden. Then it is kept in the middle of a Pav (Bun) and served with different chutney and fried chillies. It sounds simple to hear but it is one of Mumbai's most favourite snacks. It is also called the Vegetarian Burger of Mumbai. After Vada Pav, Bhelpuri is a second consecutive snack in Mumbai, which you will easily find on Chowpatty and Beaches. In this recipe, puffed rice and sev are mixed with potatoes, tomatoes, onion, different chutney and spices. It is then topped with coriander. The taste is so desirable that you will not be able to stop eating it again and again. Pav Bhaji is a dish which I can never stop myself by eating. Brinjal, pumpkin, potato, tomatoes & other vegetables are mashed and cooked with spices. It then served with pav fried in butter. This is a simple but tasty dish that you will find at every corner of Mumbai. Are you fond of Kebab with Rumali Roti? If yes, then must try them in Mumbai. Go to Mohammad Ali Road and you will find numerous options there, from great restaurants to roadside food joints. The best time to hunt for your craving is during the period of Ramadan. First, the vendor will make a hole in a crisp sphere shaped puri and then fill it with potatoes, chickpeas, onions, spices and chutney. After that, he sinks it into the sweet and sour water, which is made of mint, coriander & garam masala and topped it by Bundi. 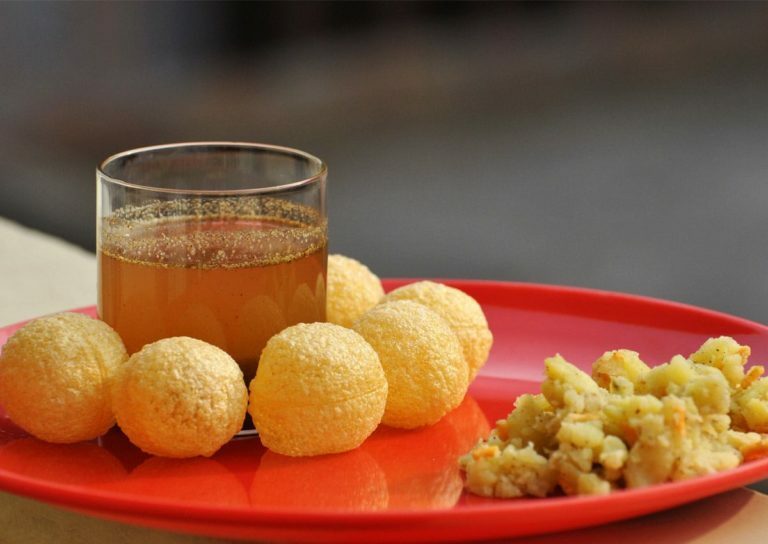 Since this snack has the main role of water, you don't hesitate to check on the quality before eating Pani Puri.